PLAY! Zine #97 – September 2016 – PLAY! PLAY! August was marked by various space-themed games, but none of them as much as No Man’s Sky. Everyone seemed to anticipate it – some expecting it to fail, some expecting a new legend to be born. We’re not sure whose prediction was right, but you can certainly decide for yourself with the help of our review. 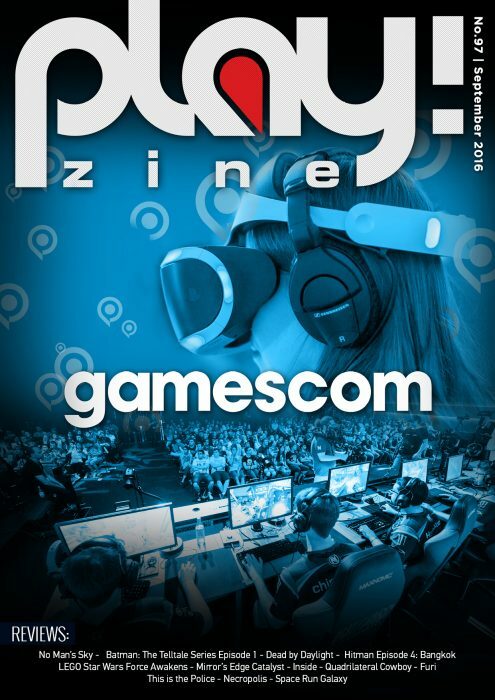 In other news, we have visited the biggest European gaming convention – Gamescom in Cologne. There we have learned much about the upcoming titles and had an opportunity to try out the latest games and gadgets. A few episodic games came out in August – Batman got the first episode of his Telltale treatment, while LEGO told us the story of Star Wars: The Force Awakens, and the bald assassin is back in his fourth episode, sneaking around and…. playing drums? You’ll have to read on to find out what that’s all about. We also sat down to talk with the man behind the YouTube channel Life of Boris in an all-new Around the Tube. We found out many interesting things, not least of which being the origin of his “cheeki breeki” catchphrase. Read the interview and visit the channel for laughs and “slav” fun. So get in your cockpit, check your thrusters, and switch to ludicrous speed – and read the latest reviews on the pages of our webzine.